​After the Huff Post rejection, Craig and I realized we had more work to do. We'd written three books (what we call Life Fables) of our 11 book series ("written by" our "Cartoon Mentors"); one in the voice of a dog, one in the voice of a young 20 something, and another in the voice of an 11 year old girl. ​These first three books (all easily read in one sitting) were purposely written this way, as psychological 'pattern interrupts' to provide the foundation of emotional intelligence -- imagination, self-reliance and will -- but none were in the voice of an adult, or revealed the depth of writing we planned for our series. While the cartoons are light-hearted and easy to read, the context of the books and blogs are grounded, and deal with serious contemporary issues. By that time, I had written the outline and the first chapter for the next Life Fable in the series, and so I began writing the next chapters of See the Music "written by" Cartoon Mentor Ms. Bee Haven. It's about a journalist who leaves her position at an upscale news organization to write her own book. Sound familiar? :) Only you can answer if this is yet another coincidence, but after reading that similarity on your Linked in profile, I knew I had to send you See the Music. Here is the link and password code to get the ebook for free: FF65J. It's a little over 100 pages, and written in two sections. The first explains our method, the second is the story. The story is semi-autobiographical. I wrote most of it right after my daughter Rachel presented her doctoral thesis. As a graduation gift, I turned the videos her Dad (my ex-husband) had taken of her as a child into a series of digital files, edited them, and then added just the right 80's songs. Rachel's Dad died the semester she began college. ​Watching those videos over and over at that proud motherly moment set the emotional and self-reflective atmosphere for the writing of See the Music. My hope is that it's as healing for others as it was for me. ​Splash City is more than a cartoon world, it's a magical journey within. Each character is a reflection, each place a perspective. Playfully reflecting our dysfunctional contemporary culture, Splash City stories encourage us to take action to change ourselves and our world, while not taking ourselves so seriously. ​Yet if that's not transformational enough, Splash City is also a means to help rewire our brains. Story, especially if written as a fable or parable, is where information can be held and eventually transformed into hard wired wisdom. So Craig and I had a crazy idea to bring Splash City into the bathtub. ​"Bathology is a simple, effective and fun daily practice that fuses soap and story to cleanse body AND mind, turning frowns into smiles and worry into wonder." To learn more about Splash City, I direct you to the Introductory Slideshow page, Bathology page, and News Splash page, where you will find the Splash in the City blogs. I suggest you begin with the blog post It's the Dance, "written by" Cartoon Mentor Mzzz Pink, who Craig and I consider the "founder" of Splash City. As a writer, its fun switching voices dependent on the theme of the blog, which may require the innocence of Miss Guided Light, the frankness of Ms. Bee Haven, or the elegance of Mzzz Pink. Splash City is ever evolving. 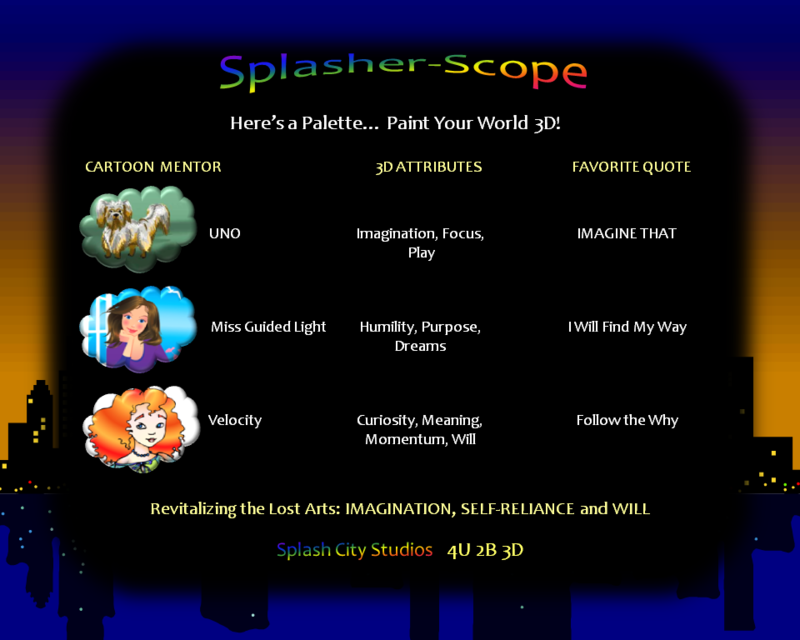 Our big dream for Splash City includes a Cartoon Mentor app, a TV series, and an interactive and educational video game. ​We'd like to do for this generation what Walt Disney did for ours; bringing back wonder to what's sadly become a cynical, wonder starved society. But first we must launch. Considering today's tumultuous cultural climate, it's time to come out of the development phase; the Information Age is fast becoming the Transformation Age. ​However, we recognize the challenge in presenting Splash City in an information overloaded culture. The paradox of presenting something serious in a playful way, via story rather than bullet points (as we proclaim on our website and books: "Information is NOT transformation"), makes for an efficient delivery system to integrate it in our hearts and minds, but quite another thing in terms of integrating into our current media culture. ​​One of the biggest misconceptions we've encountered is that upon seeing the cartoon image, many immediately assume Splash City is a comic strip. It's not. We use cartoon images to accompany our stories as a projective icon, not an art form: ﻿"The cartoon is a VACUUM into which our identity and awareness are pulled......an empty shell that we inhabit which enables us to travel in another realm. We don't just observe the cartoon, we BECOME it!" - Scott McCloud,, Understanding Comics, The Invisible Art. If after reading See the Music, you'd like to read the other three books, I'd be happy to email you the links to those ebooks as well. ​Even better, we'd love to mail you a paperback and a "Mind and Body Bar" of your choice so that you could begin experiencing Bathology yourself. ​Did you recall your favorite cartoon character? Does it match your personality?